Two-time former World Championship finalist Ali Carter believes he has "won his biggest battle" as he prepares to make a return to snooker after having chemotherapy treatment for a cancerous tumour on his lung. Carter, 35, has entered the Players Tour Championship event in Bulgaria in October, his first tournament since his diagnosis in May. "It's been a long, hard road," he said. "I'm not quite out of the woods but nearly there." The 2010 Shanghai Masters winner, who also has Crohn's disease and has already overcome testicular cancer, had three rounds of chemotherapy and has one procedure left to burn away the remainder of the tumour in his lung. Carter is a three-time ranking tournament winner, having landed titles at the 2009 Welsh Open, 2010 Shanghai Masters and 2013 German Masters, but lost to Ronnie O'Sullivan in the 2008 and 2012 Crucible finals. "I have played two finals, and I have played Ronnie twice. If I face him again in the final, it will not matter because I have won my biggest battle," he added. "I thought it was game over for me when they said there was a shadow on my lung. "I had a gut feeling inside that it was cancer and it was just a waiting game until I had all the scans and the doctor told me it was cancer. Fortunately, he said it was one he could cure. "It still looked like a mountain to climb at the time and luckily I have had positive results. I am not quite out of the woods yet but I am nearly there - I have one last procedure on the 11 September and then hopefully it will be job done." Carter says his family, friends and fellow snooker professionals helped him through his diagnosis and subsequent treatment. But it was the moment he first saw his son, Max, after his diagnosis that was to be his main motivation during his recovery. "When I came home after I saw the consultant and he diagnosed me, Max was sitting on my sofa," said Carter. "I came through the door and he looked at me and said 'daddy you are my best friend'. "I had to go upstairs and I burst into tears. I had been told I had a type of cancer in my lung and it was too much. "But I knew my son needed me, and that was my driving force to get myself better." The treatment has caused Carter to lose his hair, but he is optimistic of it growing back by Christmas which, he says, will be "a nice present". For now, though, his focus is on building up his strength and easing himself back into snooker. He said: "I have been playing a little between treatment and I have been back in the gym. I started very slowly but I am now 35-40% better than where I was. "It is a slow process getting back to normality." Aside from October's Players Tour Championship event, Carter has not committed himself to any other tournaments. 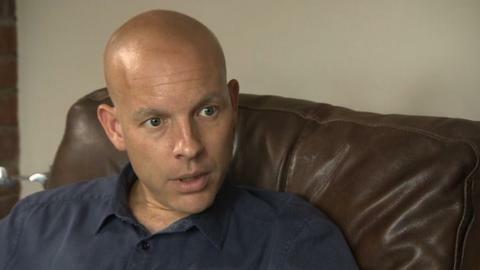 He believes it will be an emotional return when he plays at the Masters and World Snooker Championship next year, but added that his perspective as a snooker player is now much changed from what it was before diagnosis. "This has opened my eyes a little bit because winning is not the most important thing to me now," he said. "I feel it has taken the pressure off my shoulders having faced what I have faced and beaten what I have beaten. I have really got nothing to be afraid of any more. "I am nearly out the other side. It will be emotional for me to turn up at the Masters and the World Championships and that is what I have to look forward to. "Of course I want to win tournaments, but really what difference does it make? I was not thinking about tournaments I had won in hospital. I would have had it taken away from me to have my health back. "While I can hang on to that feeling I think there are some big things to come for me in sport."